Creating a good and effective resume is not only easy and understandable to read, but is also aesthetically appealing, is a challenge that many candidates and job seekers face during their job searching process. One of the most commonly occurring mistakes that many candidates commit is trying to fit all the contents within the two pages provided for the resume. For this purpose, many candidates try various methods of formatting such as using small fonts, trimming the sides and reducing the spaces to accommodate more content and information, this is a big mistake and can potentially reduce the chances of getting his/her resume selected. Not only are these tactics flawed, but they can also backfire on the candidate, which results in the resume getting thrown into the rejection pile by the recruiter. The most common reason why many recruiters tend to eliminate such formatted resumes is the fact that such congested resumes are very hard to read for the recruiter, especially when the recruiter has to deal with a large number of resumes every day. Not only such resumes waste their time, they also lose interest in the candidate thus reducing the chances of the resume being selected for the job position. Another mistake that many inexperienced candidates commit is allowing information to spill into the next page with only a few lines. This not only looks unappealing, but also looks messy and poorly formatted to the recruiter. Such formatting mistakes will not allow your resume to be selected and it also fails in implying the message that you wish to convey through the submitted resume. Most of the resumes submitted usually include contact information that is spread over at least 5 or more lines. This is unnecessary, as there is no protocol specified for such formats. To ensure that you are properly utilizing space, one needs to edit the name on the first line and add the address, email and phone numbers on the second line so as to save space for more valuable content. There is no need to spell out words like address, email and phone as it is obvious to the recruiter. However, if you are providing different number such as residential and mobile numbers, then it is necessary to add the letters so as to differentiate whether the number provided is a residential number or a mobile number. By proper readjustments of borders and margins one can save a good amount of space to include valuable content and information. One can always adjust the margin settings of their word processors, such as Microsoft Word so as to adjust the borders and margins for a coverage area of the page provided. Try not to decrease the margins and borders less than 0.6p for the side and the top and bottom margins as beyond that can make the page look smaller, congested and unprofessional. This is one of the common formatting tips that many rookie candidates and job seekers tend to forget while creating the perfect resume. Many candidates still use the age old pronunciation format of using two spaces after a period while formatting their resumes. This rule has recently been modified, so as to include more sentences within a line. Making such minor adjustments will allow the candidates and job seekers to format their sentences in a more flexible and versatile manner. Many latest computers and word processing software are also using the latest pronunciation pattern and formatting methods. Usually when including a number which is smaller than ten, the main rule that was usually followed was to write such numbers as words. But in most resumes and blogs, numbers play an important role in providing an impact to the reader. Hence, many people have started to use numbers as it is instead of spelling them out in words. Writing numbers in its numerical value saves a lot of space for the candidate and also provides more area to include important and relevant information in the resume. For e.g. : instead of writing, “propelling sales from three million to six million”, a candidate can write the given sentence as “propelling sales from 3 million to 6 million”. Numbers written in its numerical value provides more impact and understanding to the reader. While resume writing, it is necessary that the job resume is formatted in such a way that there is no excessive, repeated and unnecessary use of articles such as ‘a’, ‘an’ and ‘the’. By removing such repeated articles you can actually make some room for writing something more important. For e.g. : instead of writing, “managing a $4million sale” one can also write the sentence as “managing $4million sales” without compromising the meaning of the sentence. Try to eliminate such articles for saving more space for the resume. Orphan words or orphans are usually singular resume words that are formed on a different line while formatting the resume. To eliminate the occurrence and prepetition of orphan words, one can always resume review the sentence to find out where such words occur and try to rephrase the sentence in such a way that the occurrence of such orphan words is minimized. This allows freeing some space where candidates can include important information suitable for the resume and appealing to the recruiter during the selection process. 1. Switch the resume font to either Arial, Times New Roman or Helvetica. This to ensure that the resume is more legible and easy to read and understand for the recruiter/reader. Try using other resume font size such as Comic Sans or Calibri, it’ll make the resume more hard to read and will also be eliminated by the application tracking systems used by many company websites. Always try to use the standard and clean font that is used commonly for resumes. 2. Remove References from the professional resume. If your recruiter wants to know about your references, then they will usually ask for it during the interview process. So it is unnecessary to include such information unless asked for. 3. Do not add Generic Career objectives. This might sound fake and obvious to the recruiter/reader. Always try to use original resume objective to provide a positive impression to the recruiter. Eliminating commonly used resume objectives can save a lot of space in the resume which can be used appropriately to highlight other achievements. 4. Run a Spell Check for the most commonly occurring errors and spelling mistakes. Occurrence of such CV mistakes shows the incompetency of the candidate and can even have the potential to eliminate the candidates’ resume in the first step itself. Always proofread the resume at least twice and use spell checks from Microsoft office or get free online spelling and grammar checking tools like the Instant Spelling And Grammar Checker from Grammarly. 5. Save your resumes in PDF format. This prevents any unwanted editing from happening to your résumé during the application and submission process. Also, try to submit the resume format in a file format that is specified by the company website, unless specified always save the resume in PDF format. This is necessary, as many applicant tracking systems try to select resumes based on the correct format specified by the company. 6. Naming your Resume File. 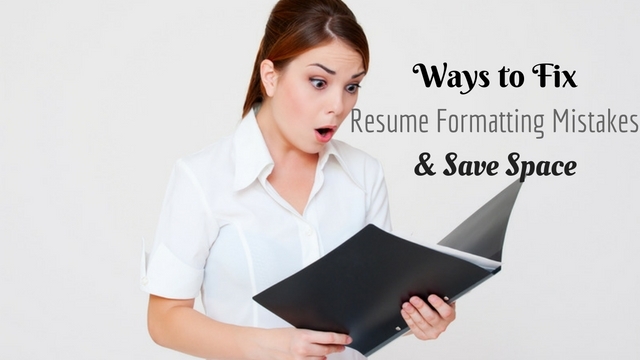 While saving the resume, instead of saving it with file name as just “Resume”, try saving it using the format , “ Your Name : Resume” as it makes it easier for the recruiters to identify and recognize your resume from the generic application lot. 7. Removing the Address . Remove your address from the resume for job as many recruiters tend to contact the candidate either through their email addresses or their contact numbers. Moreover, if you’re not local or a citizen of the country, most recruiters don’t tend to look further into your resume. 8. Include professional social networking links, such as LinkedIn and twitter. Avoid your Facebook profile link as this is not considered professional by many companies. Depending upon the job position that you are applying, such as in creative media or marketing agency, you can also include social media links such as Instagram, Flickr, Soundcloud if needed. 9. Ensure all links are live . All the links that you provide in your resume are live and can direct the visitor from your resume to your social media page. Try to check if the link is working before submitting you résumé to the company website. 10. Use URL Shortners for long links. Long URLs not only take up space, but also make the resume look congested, messy and unprofessional. Instead, try to customize your link according to your name so that it might look appealing and attractive in your resume. Many popular social networking sites such as LinkedIn and twitter provides name based customization to URLs for easy usage and access for candidates and job seekers. 11. Avoid mentioning graduation years . If you have graduated from college taking more time than usual then it is better to not mention the graduation year. Many recruiters do tend to enquire what the candidate has done during the gap years. Also, to eliminate discrimination based on age of the candidate it is better not to use any year that specifies that the candidate has taken a break before applying for the job. 12. Avoid mentioning information that reflects you age, religion and marital status. Asking for such information is illegal in many countries and this will mean that your resume is evaluated on the basis of your experience and capability. 13. Unless you are a recent graduate, while formatting the resume try to rearrange the contents of the resume by arranging the education column below the experience column. This is necessary for recruiters who wish to hire by giving more importance to the work experience and activities rather than education statuses and grades. This is also a great way to show recruiters the various activities and job experiences that you have which are relevant to the job position applied. 14. To Save space, remove high school activities that aren’t relevant to the job. These are unnecessary for candidates who have entered college or are graduating from college. If there is any high school activity that you have done, which is highly relevant to the job position applied, then feel free to add such experiences and activities. 15. Updated Skills and experience section. This shows the recruiter that you are always enhancing and developing yourself as potential job seeker and the resume is a clear indication of what all experiences you have achieved during your learning process. These are some of the tips and tricks that one can use while formatting and creating their own versions of the perfect resume. To make the resume even more impressive, try to ensure that your resume is easily understandable and legible to the average person, try to ask for help from a trusted friend and make them proofread your finished resume. This method will not only help you to pinpoint the errors and mistakes that you have made and failed to notice, but will also enable you to get a proper feedback. After formatting the resume up to the proper standards try applying the resume along with an impressive cover letters to various companies that you wish to join and work.